Shop and save now with Veer coupon code. Veer has a huge selection of creative stock illustrations, photos and fonts. 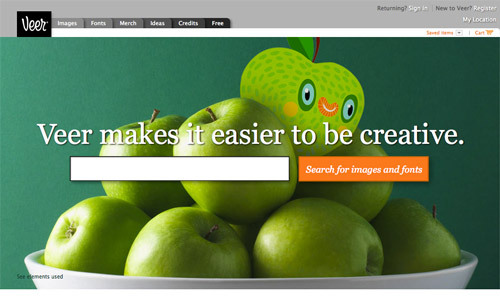 It is a one stop resource library to help you find creative elements for your design projects and marketing materials. Get 10 FREE credit when you singup here! Limited time offer! Veer.com provides elements of design and creativity which makes it easier to be creative. It contains creative elements to help people add style to professional or personal creative projects. Also, Veer offers a range of fashionable elements including creative photography and illustrations, fonts and even merchandise. When in need of photograph and illustrations for projects, Veer is the safest place to buy images online and it has a wide selection of more than 1.5 million reliable and affordable photographs and illustrations that covers all categories such as people, family, lifestyles, business, concepts, technology, nature, travel, backgrounds and more. Images are available in six standard sizes: extra small, small, medium, large, extra large and extra, extra large. Prices vary depending on the image and the image size. So if you need the smallest size of an image, expect to pay the lowest price, and thousands of new images are added regularly to appeal tocreatives of all kinds. The latest and greatest fonts are also available at Veer.com. Though fonts that came with your computer are great for daily use, it is better to have something new and that really stands out. Veer offers more than 12,000 fonts that customers won’t find anywhere else. Fonts start $10 including many veer exclusives. Fonts include display faces, text families, scripts, as well as picture and symbol fonts. The also have a wide collection which includes Umbrella™, stylish and contemporary display faces handpicked from around the world; Jukebox™, inspired by sign painting and vintage Americana; Cabinet™, distinctive text families for large projects and logos featuring recognized international foundries like TypeTogether; and Red Rooster™, which offers new designs and interpretations of historic fonts. Fonts are also added regularly by expert and talented designers. In its assurance to bring distinctive and fascinating designs and contents, trends and styles to customers, Veer also sells merchandise on its online store, which includes apparels, paper goods, coffee mugs and accessories that are wisely picked by Veer to provide appealing designs to its artistic audience. Moreover, purchasing images and fonts and even merchandise was made quick and convenient. Customers can do it either one at a time with a credit card or with Veer credits. Offering high quality, filtered images and fonts through a simple, easy-to-use website, Veer became a one-stop source for designers and art directors looking for a creative advantage. Uh oh. The offer code (code) is either not valid, has expired, or applies to a different credit pack. Check the code and the selected credit pack, and try again. I have checked with Veer team and the Veer coupon code is working and valid. The credits do not show up in the cart till after a credit card has been run. So it appears to not have added them.